My first post on this subject covered the early George Eliot novels published in Tauchnitz from 1859 to 1863. After this early burst of creativity in her writing career, there was a longer pause before her next novel, ‘ Felix Holt the Radical’, was published in the UK in 1866. The continental edition did not immediately follow and Eliot had to write to Blackwood, her UK publisher, in February 1867 to pass on comments of ‘deep regret that Felix Holt is not published in the Tauchnitz Edition’. Tauchnitz had perhaps hesitated following disappointing early sales of ‘Romola’, but he needed no second prompting. Terms were agreed the following month and ‘Felix Holt’ appeared in May 1867 as volumes 897 and 898 of the Tauchnitz series. The first printing is distinguished by a list of Eliot’s 5 previously published titles on the half-title verso of volume 2. Later printings list other titles published later than 1867. Perhaps Eliot remembered the initial lack of enthusiasm from Tauchnitz over ‘Felix Holt’ when her next novel, Middlemarch’ was published in 1870. She might also have had in mind that Tauchnitz had purchased the rights to ‘The lifted veil’, but had still not published it. Or perhaps we need no reason other than money to explain why she decided to abandon Tauchnitz and entrust her novel to a untested publisher launching a new series. 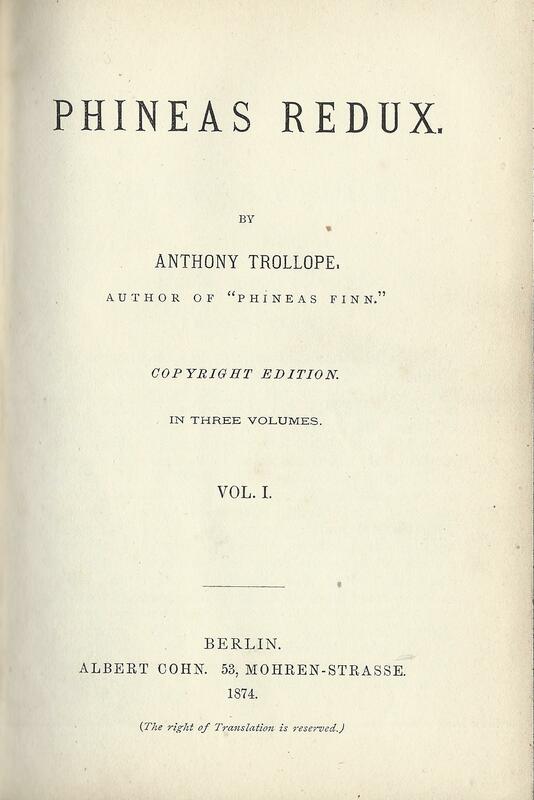 A. Asher & Co. was an established German publisher in Berlin, run by Albert Cohn, a literary scholar and Anglophile, but it had no track record in publishing English literature in the original language. It must have paid heavily to acquire the rights to ‘Middlemarch’, probably significantly more than Tauchnitz had ever offered, and used it as the basis to launch a series in competition to Tauchnitz. To recoup its costs, Asher split Middlemarch into 8 separate volumes and charged a premium price for them. For a period it was a very significant competitor and tempted many authors away, but in the end most of them, including Eliot, returned to the Tauchnitz fold. In 1874, Asher’s Collection, by then under the imprint of Albert Cohn, also published ‘The legend of Jubal’ and other poems. By 1876 though, when ‘Daniel Deronda’ was published, the series had been taken on by a new publisher and was no longer a serious competitor for Tauchnitz. It was probably at this point unable to offer the same level of advance payment, whereas the generosity of Tauchnitz had been stimulated by the loss of Middlemarch. In a section of George Eliot’s letters, referring to the continental edition of Middlemarch, there is a footnote in the Tauchnitz Edition to record that ‘The author was subsequently induced to publish “Daniel Deronda” and her succeeding works again in the Tauchnitz Editions. Baron Tauchnitz paid £250 for “Daniel Deronda”.’. Does the eagerness of Tauchnitz to record this betray his pain at the loss of Middlemarch, or at the subsequent cost of recovering the author for his series? Certainly the amount paid was considerably higher than the £50 he had paid for Adam Bede, and the £100 for ‘The mill on the Floss’, although these were when Eliot was much less well-known. On the other hand, it’s a long novel, and Tauchnitz could cover his costs by stretching it out into four volumes, and so it appeared in December 1876 as volumes 1617 to 1620 of the Tauchnitz series. No first printing copies in the original wrappers are known to have survived, but privately bound copies in the original state are less difficult to find, listing 6 other titles by Eliot on the half-title verso of volume 2. Deronda was the last of Eliot’s novels, but not the last of her writing, and first there was some unfinished business for Tauchnitz. He had bought ‘The lifted veil’ back in 1859, but still not published it, and now saw the opportunity to put it together with another earlier work, ‘Brother Jacob’. The two appeared together as volume 1732 in April 1878, and were followed in June 1879 by ‘Impressions of Theocrastus Such’ as volume 1828. Paperback first printings of both are pictured below, and bound copies are identified by listing 7 titles and 8 titles respectively on the half-title verso, in each case only the titles previously published. Eliot died in 1880, but interest in her work and her life continued. As well as continuing to reprint earlier works, Tauchnitz in 1884 (volume 2229) published ‘Essays and Leaves from a note-book’ – mostly early essays that had been published in the ‘Westminster Review’. The first edition lists 9 previous works by Eliot on the half-title. Then the following year Tauchnitz published in four volumes ‘George Eliot’s Life as related in her letters and journals’, edited by John Cross, the husband she had married shortly before her death. This is volumes 2318 to 2321 of the series and as it is the last of her works to be published, all ten previous titles are listed on the half-title (of the second volume). There is therefore no easy way of recognising later reprints of privately bound copies, although it’s likely that it was reprinted. Overall from 1859 to 1885, Tauchnitz published 22 volumes of George Eliot, including almost all her significant works other than Middlemarch, which remains an unsightly gap in the record. There’s still one minor footnote to record. In 1886 Tauchnitz launched a new ‘Students’ Series for School, College and Home’, made up of English texts with German footnotes and and a German introduction. He chose ‘The mill on the Floss’ as volume 2 of this series, although it is considerably longer than most other volumes and sold at a premium price of M1.70 for the paperback edition. Like most of the George Eliot works it was reprinted regularly over the next 40 years.